Back to school is in the air but there are a few more weeks of summer left on the calendar. If we’re lucky there will be many more weeks of beautiful weather into the fall. 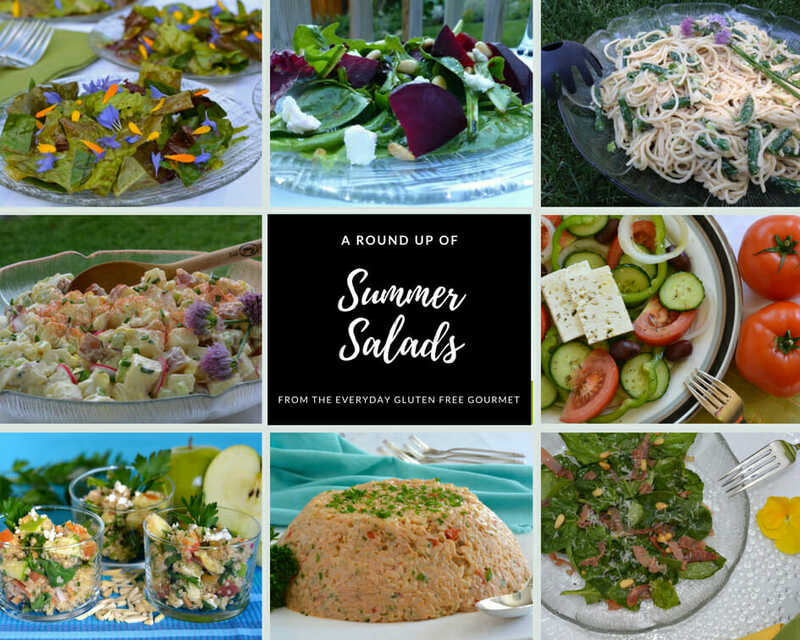 Why not extend the feeling of summer by making a recipe or two from my Round Up of Summer Salads. I’ve included some of my favourite big bowl salads, the kind you can take to a Pot Luck or serve at a late summer barbecue. Of course I couldn’t leave out some lettuce salads and at the end I added a few main course salads for good measure. This California Roll Salad has all the elements of a California Roll put together in a big bowl and it brings rave reviews at every Pot Luck. For noodle lovers this Spicy Sesame Noodle Salad has and Asian flare and a little zing from some chili oil. If you like tuna this simple Summer Rice Salad is greater than the sum of its’ parts. Actually a Spanish tapa recipe it must be made to be appreciated. This Apple Quinoa Salad with Feta is perfect for Pot Lucks and lunches too. Or a Southwestern Quinoa Salad, possibly drizzled with some chipotle mayo. Some would say a Canadian Potato Salad, or your grandmothers’ version of potato salad is essential at every family barbecue. In my house we only eat homemade salad dressing and these dressings all start with the basic recipe of oil and vinegar that makes a vinaigrette. Variations of the recipe are included in the post but for this salad of Garden Greens with Edible Flowers I simply sprinkled on some colourful petals for a dynamite presentation. This green Salad with Beets, Goat Cheese and Pine Nuts highlights roasted beets which are plentiful in gardens and at Farmers Markets now. No matter what the weather this Warm Spinach Basil Salad is not to be missed. It includes all the ingredients of basil pesto so be sure to use top quality oil and your best Parmesan cheese. I make my Greek Summer Salad all year long but with tomatoes at their peak this is the time of year to enjoy vine ripened tomatoes in as many dishes as you can. And finally, the premiere salad of Indonesia, Gado Gado. What’s one of your favourite salads or did you make one of these? Let me know in the comments below.